My car is parked on the dockside in the shadow of a tall, decrepit looking building that may once have been a mill or a warehouse or something. Rain hammers on the windscreen. 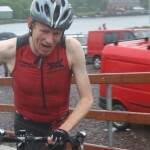 If Martin Scorsese did triathlons, they would look like this. Race briefing is in five minutes and, still not in my wetsuit, it’s the first time in a short and unillustrious career as a triathlete that I’m thinking of giving it a miss. This was supposed to be the perfect triathlon: a roadtrip with the wife and daughter to visit old friends in Westport and a sprint triathlon on a Saturday morning in July thrown in for good measure. And then my poor daughter broke her arm. So, I found myself leaving Kenmare on the Friday night, facing the long journey north alone. Arriving just before midnight, I fell asleep hoping against hope that the weather forecast was wrong. I open the car door, step out into the wind and rain, mutter my way into the wetsuit and arrive late for the briefing. We’re sent shuffling along the dock to the steps down which we must all descend to the water. Standing there shivering, waiting our turn, we must look like some band of rubber-clad penitents. The sea water feels balmy – it’s all relative I suppose – and when the horn sounds we all do what we’re here to do. The swim is fun: choppy water but a tide behind us and no sighting worries when the orders are to swim down to the end of the pier and back up the other side. As usual, when I reach transition, there are very few other bikes to get in my way and, after nearly catching pneumonia in similar conditions last month in Sneem, I stick on a few extra layers for the cycle. Off out the road west into the teeth of a stiff breeze. Is that Croagh Patrick behind a wall of grey cloud? If so, it’ll be quite the scenic ride when our summer arrives. At least the wind’s behind us after the turnaround. The run through Westport House is picturesque and we even get a gravel path for part of it. After crossing the line, I’m pleasantly surprised when the man sheltering in the van gives me a time just under 1.40. My hosts Gina and Stevie serve me a wonderful post-race brunch and, after a power nap, I feel sufficiently recovered to strike out for Kenmare. I return home just inside the 24 hour mark. 210 miles, 750 metres, 20 kms, 5 kms, 210 miles, wind, rain, possibly even some hail. Worth it? Every inch – but could we please have some sun for the next one?